The 2014-2015 school year will begin for students on Tuesday, Aug. 19, 2014, according to the calendar approved by the Board Monday night. The last day of school will be Friday, May 29, 2015. Graduation will remain on Memorial Day weekend, with commencement exercises Sunday, May 24, 2015. To view the full academic calendar visit the “Calendars” page of the District website or click here. A report on students who were expelled during the 2011-2012 school year showed most are re-enrolled in Marshalltown Schools and working toward graduation. The status report focused on the 2011-2012 school year because no students were expelled in 2012-2013. Lisa Koester, Director of Human Resources and Student Issues, told the board nine students were expelled in 2011-2012 and three were serving out expulsions from the 2010-2011 school year. Of those 12 students, seven are now enrolled in Marshalltown Schools. Out of the remaining five students, one moved out of district, one dropped out, one was placed in foster care outside the district, one is incarcerated and one enrolled in Job Corps in Dennison, Iowa. 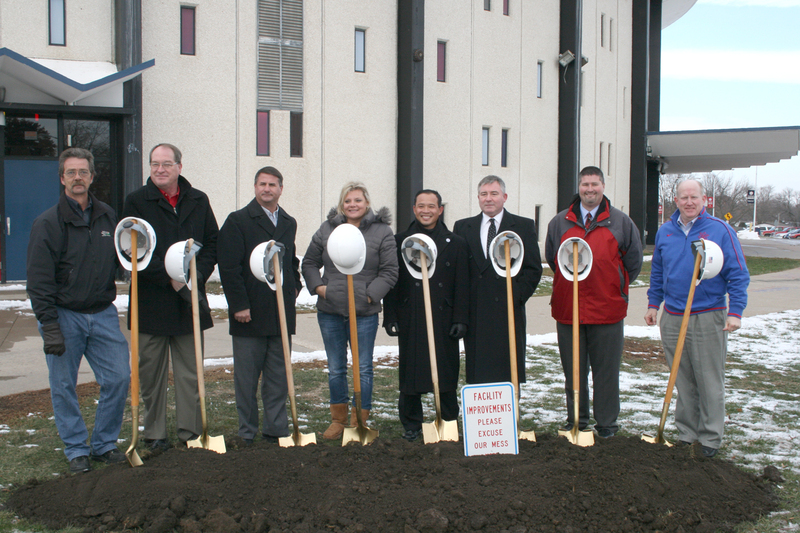 Roundhouse groundbreaking ceremony in November 2013. The Board approved CPMI as project manager and RDG as architect on Phase 2 of the Roundhouse project, taking the first step toward completing the community-funded portion of the project. Phase 2 includes an auxiliary gym and wrestling room with estimated cost of $3.8 million. Jennifer Wilson, Board vice president and member of the District Design Advisory Committee, said the fundraisers have almost reached the $1 million needed for the matching grant from the Martha-Ellen Tye Foundation. The DAC agreed fundraising had progressed enough to move forward with these contracts, which pave the way for design development and drawings. Work on the first phase of construction is currently underway. During Monday’s meeting the Board of Education approved two contracts that are important to the many individuals involved in the Renovate the Roundhouse effort. The contracts authorize CPMI (Project Management) and RDG (Architectural and Engineering) to begin designing for new construction of an auxiliary gymnasium and wrestling room at the Roundhouse. These much-needed additional structures are being funded by generous donations from individual, corporate and foundation supporters of the Bobcats from all across the country. Although additional funds need to be raised before construction can begin, the Board expressed confidence that the design process should begin now – so construction can be started, without interruption, as soon as fundraising targets are met. The ability to extend the scope of the Roundhouse renovation/expansion is just the latest in a long list of projects demonstrating Marshalltown’s strong commitment to the education and health of its residents. Tonight the Board was updated on the status of expulsions for the 2011-12 school year. Of the 12 students that were expelled that year, seven have continued their education here at MCSD and are on track to graduate. The remaining five students have left the district or have extenuating circumstances that prevent them from finishing their degree requirements here. We struggle with expulsions when they occur, but know the discipline and standards must be high to ensure the well being and safety of our schools. The great news is that for both the 2012-13 and the current 2013-14 school years we have zero expulsions to track. The district has implemented the PBIS (Positive Behavior Instruction Support) model and the students have accepted the challenge to raise the bar on behavior and attitude. Thanks to all of the students, staff, and administration for your efforts. 503.7 Attendance at Events Outside of School, deleted. 503.8 Student Honors and Awards, waive second reading. 503.3 School Publications, bring back with corresponding regulation. 504.1 Student Health and Immunization Certificates, mark reviewed. 504.2 Exclusion for Communicable Diseases, mark reviewed. 504.3 Injury or Illness at School, mark reviewed. 504.4 Use of Bicycles, mark reviewed. 504.5 Use of Motor Vehicles, mark reviewed.